A Movement from "Scenes without Words". For Violin, Cello and Piano. Full work available here. 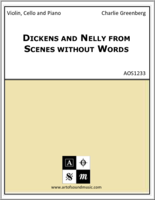 Dickens and Nelly - An adaptation of a love duet form Act II of “Dickens and Nelly”, a collaboration between librettist Barbara Zinn Krienger and Charlie Greenberg, based on the scandalous, 13 year love affair between Charles Dickens and actress, Nelly Ternan.